Whose idea was this? Pitching, sliding, rattling, tossing … this was not serene and peaceful narrow boating! 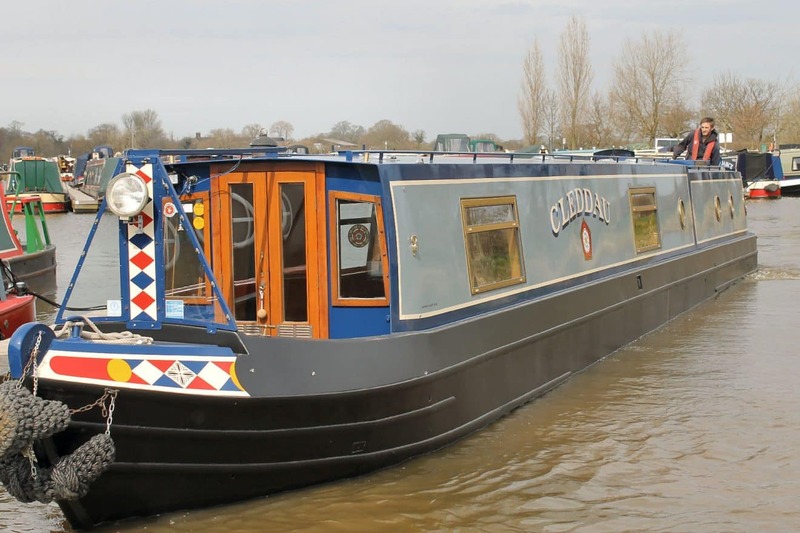 But to backtrack: Cleddau, Tentatrice and crews had navigated to Boston in South Lincolnshire en route to Bedford for the mid July River Festival . The cruise plan was to cross the sea (The Wash) from Boston to King’s Lynn in Norfolk, guided by a pilot who has knowledge of the local waters. The trip had been done in reverse in 2014 (accompanied too by Chouette) and so the crews had some idea of what it would involve. There had been phone calls aplenty between The Captain and the pilot Daryl Hill (07909 880071; email: [email protected]). Suitable tides (for locking out of Boston) needed to be established. Suitable weather (six or more hours on open water in rough weather would not be desirable) was vital. The trip was to be a two day event, first from Boston to the council-run pontoons at King’s Lynn, and then secondly onward (again tide dependent) up to Denver Sluice to access the River Great Ouse. and a chance finding of Boston’s five sailed windmill . The church (where the 1630 pilgrims to Boston, Massachusetts are remembered) plays a central role in community support for the town and district. where for £1 donation a Lego brick is added to the building and the money goes to supporting community groups. An evening stroll with Tentatrice First Mate Jennie and Boat Dog Monty to a nearby country park provided more touching reminders of the key features of the area. ladder accessible from the bow, cratch cover zipped closed, the culinary herbs moved from roof to shower, cupboards and drawers lashed shut with bungee cords and rope, boat-cooked Welsh cakes made for emergency rations… (Boaters contemplating a sea trip see further notes below from the Captain). to wait for the tide to equalise with the level of the river. The pilot Daryl Hill (see contact details above) arrived and took up position on Tentatrice which has a more spacious rear deck. and down through the docks. The radio crackled into life, Daryl from Tentatrice reporting the narrow boats’ approach to the flood barrier construction site. “No divers in yet,” was the response. Oh, how local knowledge is needed. The docks left behind, the scene became more rural. Geese patrolled on the mudbanks, cows grazed on the grassy sides. The only sounds were of birdsong and water slap against the hull. The boats purred along, smoothly on a slack tide. Almost imperceptibly the channel was growing wider and the land alongside flatter. the marker point that divides the channels of the Haven to Boston from the Welland. Once past Tabs Head the water was open and there was slightly more swell. 1150, passing Buoy Number 15. The Captain assessed the water surface now as at Sea State 2. The course was heading NE, at 6.2 mph, according to the hand-held GPS. A long way off a fishing vessel was preparing its beam nets. The scene now was of ‘The lonely sea and the sky’ A lump of seaweed passed by, seabirds soared over the boat and spray began to skit against the hull. The wind increased: “Better check the front doors are closed,” the Captain advised. Words from the notebook: “1255: rough patch.” That was Sea State 3 (slight), in the Captain’s opinion, confirmed later by Daryl (See Sea State chart ) Instinctively hands became clamped to the engine hatch rails while feet and legs were anchored to the floor boards. The hours passed by, Cleddau shadowing Tentatrice, the Lincolnshire coast fading from sight though there was no hint yet of the coast of Norfolk. The boat pitched and rose, the Captain pointing the bow into the waves while still following the lead boat, marker buoy after marker. The Welsh cakes were fetched – energy pills for the rear deck crew. The radio crackled into life again: Tentatrice to Cleddau: in 10 minutes expect a sharp 90 degree turn to starboard. Watch for 2 big waves, turn fast afterwards. The turn (smoother than anticipated) was made at 1400. The wind was blowing from behind now; steering became easier, the chill on the bodies lessened. “Wouldn’t mind a sausage roll if you can get one,” the Captain muttered. Down in the cabin there seemed to be some disarray, a few CDs had skidded across the floor, likewise the cooking utensils pot and contents. The black wooden stool (a gift from Senior Sis and Salty many years ago) had toppled over. The radiators and cupboard doors were rattling but, apart from the floor lurching at odd angles, all seemed reasonably well. heading now for King’s Lynn. while to starboard a colony of seals lolloped, rolled and flipped on the sand and in the sea. A stream of silvery sunlight from the west lit up the water and warmed the skin. Now the water’s surface was merely rippled, sandbanks and water forming quiet parallel lines. Seabirds crowded the water ahead, feeding, gliding, wheeling. By 5pm the boats were approaching King’s Lynn. Scourings in the mud banks were a stark reminder of how boats need a decent water depth beneath their hulls. – and the fast, little foot passenger ferry running between King’s Lynn and West Lynn. Ahead was the mooring pontoon, the historic Baden Powell moored at the far end. Boats and crews were safe, all thanks to Daryl’s expertise. ‘Time and tide wait for no man’ (Geoffrey Chaucer). It was early to bed, alarms set for 0500 for a 6am departure upstream on Friday morning on a rising tide to Denver. That will come next time. For the Tentatrice perspective of the trip which includes superb photos and videos see here . This is what Boatwif and I do to prepare for a sea crossing. Taking a canal boat to sea even for a short crossing of the Tidal Thames to Limehouse, the Wash or Sharpness to Bristol is a serious decision and your personal responsibility. Tell the Insurance and get permission for a sea crossing. The boat will be shaken about so we make sure that there is no water sediment in the fuel tank and, if possible, fill up with diesel just before the crossing. We also empty the domestic water tank in the bow by half to give more buoyancy. We have an anchor and suitable length of chain and hawser available. We have lifejackets for all on board for the duration of the voyage. We have Marine Band VHF. To operate requires a licence. The Pilot may supply portable VHF sets. Weather – let the Pilot decide but Sea State (SS) 3 (Slight) is certainly my limit. We were offered SS3 from Sharpness to Portishead by the Pilot (2015) but he advised waiting a day for a much more comfortable SS1. Everything that may move on the roof needs to be strapped down, even in a SS1 wind against tide can make it very lumpy for a canal boat. Inside the boat we strap the drawers and cupboards closed. We move anything breakable onto the floor and secure/ protect with cushions. Expect the contents of cupboards to move about. Front deck. The cratch cover needs to be securely in place; seal any gaps to the hull or bow decking with duct tape. Sealing the outflows from the front deck is a personal decision – ours are small and we leave them open so any spray entering the bow can escape. If you have larger vents you may wish to close them to stop sea water getting in. If you don’t have a cratch cover then you may wish to seal the front door/s and accept water in the front well deck, make sure that it can flow out through drain holes. I fit navigation lights and a short mast on a temporary structure, this includes a radar reflector, and I have inshore emergency flares (not essential, but I am a wimp). Make a flask of a warm drink as you may not be able to make hot drinks in the galley. Crikey I feel ill now after seeing the bow of Cleddau dipping deep into the waves. I am so relieved all of you are safe and sound on calmer waters. Great pictures Sue and Jennie’s video was good as well. I forgot to put that on my comment to her blog post. I am happy to report no serious swells of any kind here on the Llangollen. I tell you, Jaq, there’s a great comfort in being back on flat water!